You'll be £10.00 closer to your next £10.00 credit when you purchase The Struggle for the Dardanelles. What's this? 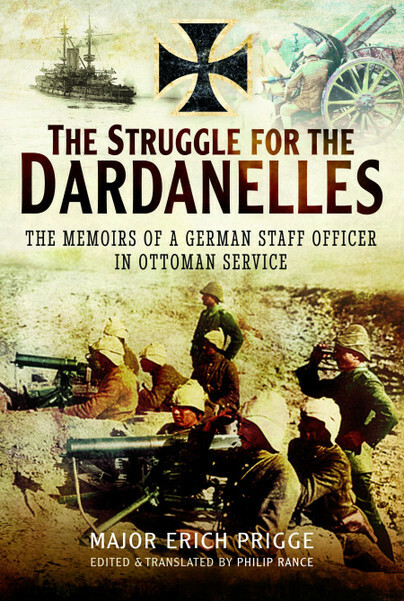 This is a detailed eye-witness account of the Dardanelles/Gallipoli campaign from the perspective of the Turks, through the eyes of Major Erich Prigge an adjutant to Marshal Liman von Sanders, the German commander-in-chief of the Ottoman forces in the Dardanelles. The focus is overwhelmingly on combat but includes related matters such as reconnaissance and logistics. Packed with specific information and technical detail as well as action, it should be of great interest to historians and enthusiasts. Prigge actually wrote two accounts of the campaign. The first, published in January 1916 while the fighting continued, revealed so much information that the Ottoman government asked the German authorities to suppress it. The other, published later that year, included coverage of the British evacuation. Although Prigge had removed many of the sensitive details of unit names, casualties etc, he had substantially rewritten and augmented many passages with lively descriptive material. Philip Rance here presents the first English translations of both versions, which together form one of the most complete and valuable accounts of this campaign available from the Turkish perspective. Excellent scholarship - evident throughout Rance's supporting text in this well-annotated book. Of value in understanding the role a German staff officer during the Gallipoli campaign - and as such we should read and digest it carefully. This is a rare insight into the German perspective of the Gallipoli Campaign. The author is providing a first hand account of his impressions and understanding of the Campaign – Highly Recommended. Dr. Philip Rance is a historian and classicist who has published extensively on military literature and culture. He has taught at universities in the United Kingdom and Germany and held senior research fellowships in Munich and Istanbul. He lives in Berlin, where he holds a Humboldt-Foundation Renewed Research Fellowship at the Freie Universität.